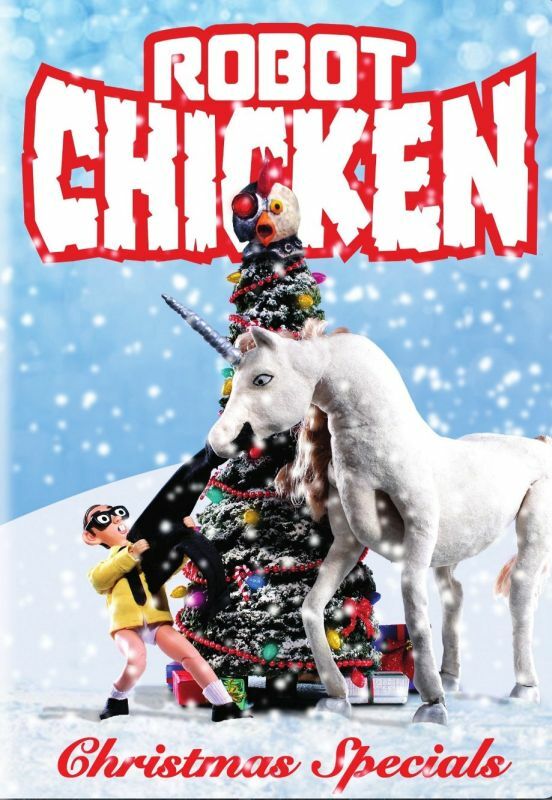 The Robot Chicken: Christmas Specials DVD was just released which containing all 6 of the Christmas episodes. That may sound like a decent amount, but remember that Robot Chicken episodes are only like 10 minutes long so it's really only like an hours worth of episodes. They span from 2005 to 2013, and the early episodes are easily noticeable because they weren't made in widescreen like the later episodes. Not that they look bad, but it's just noticeable. And actually, I enjoyed the earlier episode more than the later ones. Not sure why, they just made me laugh more. The first one features the Dragonball Z characters along with Santa who cusses up a storm, though the cussing is bleeped. In all the other episodes the cussing is left in-tact. I don't mind either way, as even when something is bleeped it's usually pretty clear what they were saying.Sometimes the bleeping can make it even funnier. There isn't much story to the episodes, just a bunch of short little usually hilarious clips. Watching Santa murdering left and right is always fun, but there are other skits involving other much loved cartoons and movies from our childhoods, such as G.I. Joe, The Grinch, Peanuts, Batman, DragonBall, Home Alone, and more. They're all pretty good, but I really wish they would have included some additional episodes, even if they weren't Christmas-related. The extra features on the disc include audio commentaries, deleted scenes and animatics, and old promos, so we get a little more content that way. It's an enjoyable DVD but I would have really just liked to have more content.